Katie Cox of Conroe, TX, and Hocus Pocus VH Hof Ter Heide, owned by KLC Investment Group, LLC, took home the blue ribbon in the $20,000 Under 25 Jumper Classic, the culmination of the inaugural running of the Under 25 division at the Pennsylvania National Horse Show, presented by The Lindsay Maxwell Charitable Fund. Hunter Holloway of Topeka, KS, was second on VDL Bravo S and Lucy Deslauriers, New York, NY, and Hamlet, owned by Lisa Deslauriers, was third. "It's amazing to win," said Cox. 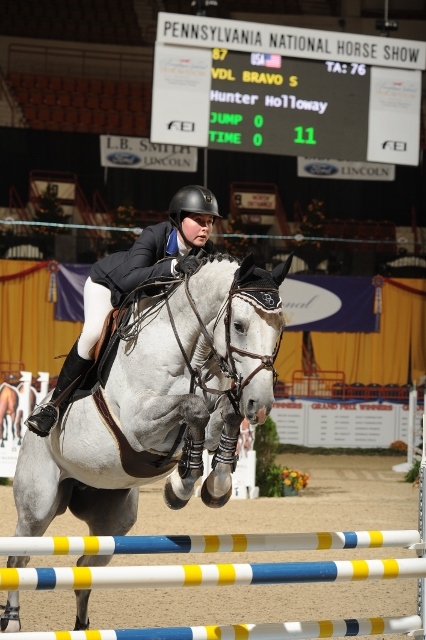 "I have only ever done the Prix de States (Junior Jumpers) here. I haven't been back since my junior year, so it's been four years. 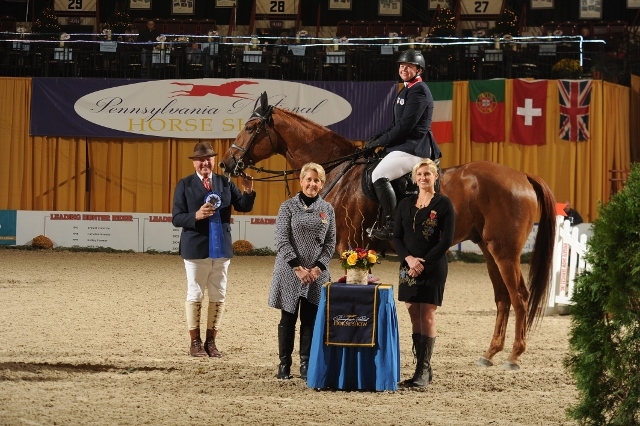 To come back here and win the Classic and be Reserve Champion is awesome, it's a great feeling." 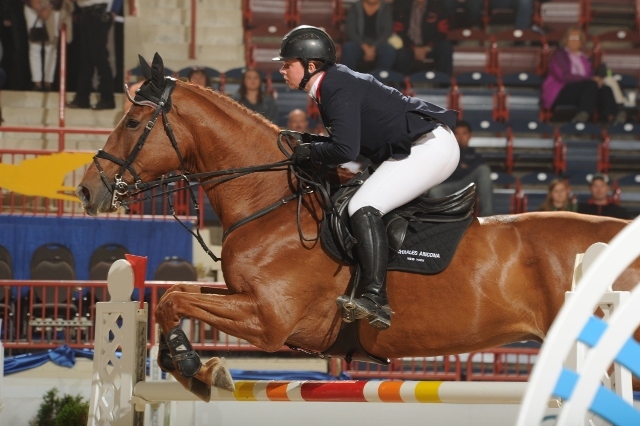 Five riders out of the field of 13 made it to the jump-off in the Classic. Holloway was the first to return on VDL Bravo S and set the mark going clear in 27.24 seconds. The pair had a bit of a mishap after the first fence, which she believed cost them the win. "I was hoping that my time would hold up. I had my fingers crossed," said Holloway. "I was pretty nervous though, because after the fence we had a pretty big trip and it took us a second to recover. I wasn't sure if I was going to fall off or not and I knew that trip took a bit of time. We had a pretty good recovery and the rest of the course was pretty smooth, but I thought it was a catchable time because I lost a couple of seconds there when he tripped." The time did hold up for a while. Callie Smith, Bernardsville, NJ, and Attention Et Z, owned by Smithfield Farms, LLC, and Mattias Tromp of North Salem, NY, riding Whatever RV, owned by Beyaert Farm both had rails. Deslauriers was on track to beat Holloway and finished with the fastest time of the day, 25.41, but it was at the cost of a rail at the last fence. Cox was the final rider on the Bernardo Cabral-designed course and put in a flawless fast trip to finish in a time of 26.64 seconds. "My plan was to just be smooth and tidy. My horse covers a lot of ground, so I trusted him to make up the pace," said Cox. "He was amazing. I have only done one indoor show with him, so I thought, 'let's see how he goes', but he jumped awesome in both rounds." Hunter Holloway will have her named added to the James V. Tanzola Family Perpetual Trophy as Champion of the Under 25 Jumper Division on VDL Bravo S. Katie Cox and Hocus Pocus VH Hof Ter Heide were Reserve Champions. 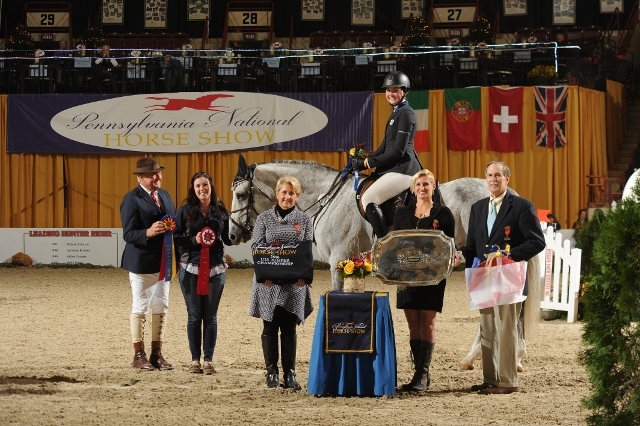 Holloway was also named Leading Rider in the Under 25 Jumper Division, sponsored by Mr. and Mrs. Norman White.